Exoplanets, planets in other solar systems, can orbit very close to their host star. When, in addition to this, the host star is much hotter than our Sun, then the exoplanet becomes as hot as a star. The hottest “ultra-hot” planet was discovered last year by American astronomers. Now, an international team, led by researchers from the University of Geneva (UNIGE), who joined forces with theoreticians from the University of Bern (UNIBE), Switzerland, discovered the presence of iron and titanium vapours in the atmosphere of this planet. The detection of these heavy metals was made possible by the surface temperature of this planet, which reaches more than 4000 degrees. This discovery is published in the journal Nature. That is why NCCR PlanetS researchers affiliated with the University of Bern recently performed a theoretical study on the atmosphere of the planet KELT-9b. “The results of these simulations show that most of the molecules found there should be in atomic form, because the bonds that hold them together are broken by collisions between particles that occur at these extremely high temperatures,” explains Kevin Heng, professor at the UNIBE. This is a direct consequence of the extreme temperature. Their study also predicts that it should be possible to observe gaseous atomic iron, in the planet’s atmosphere using current telescopes. This discovery reveals the atmospheric properties of a new class of so-called “ultra-hot Jupiter.” However, scientists believe that many exoplanets have completely evaporated in environments similar to KELT-9b. Although this planet is probably massive enough to withstand total evaporation, this new study demonstrates the strong impact of stellar radiation on the composition of the atmosphere. Indeed, these observations confirm that the high temperatures reigning on this planet break apart most molecules, including those containing iron or titanium. In cooler giant exoplanets, these atomic species are thought to be hidden within gaseous oxides or in the form of dust particles, making them hard to detect. This is not the case on KELT-9b. 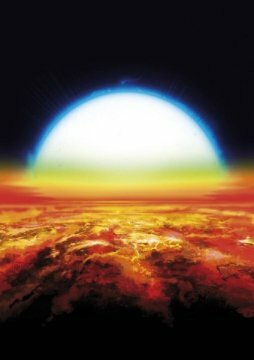 “This planet is a unique laboratory to analyze how atmospheres can evolve under intense stellar radiation,” concludes David Ehrenreich, principal investigator with the UNIGE’s FOUR ACES team.